A Mexican fish-eating bat fishing. Photo from Oikos by M. Tschapka. Hi everyone! I hope you all had a good week. It has been another difficult week for a lot of people. Not only did Hurricane Irma move through the Caribbean and Florida destroying everything in its path, but wildfires are burning in the western United States. My thoughts are with everyone affected by these disasters. While the US has been dealing with hurricanes and fires, the country of Mexico has been dealing with its own disasters. Last week, an 8.1 magnitude earthquake hit Mexico. This was the worst earthquake to hit Mexico in a century. Just hours after the earthquake, Hurricane Katia hit Mexico’s Atlantic coast. A few days later, Hurricane Max hit Mexico’s Pacific coast. I would like to dedicate this week’s blog to the people of Mexico. These disasters affected the entire country and my thoughts are with you all. Mexico has a total of 137 species of bats. One of these species is the Mexican Fish-eating Bat. The Fish-eating bat is an adorable bat that lives near the Gulf of California in Mexico. Instead of bugs, this bat loves eating fish and crustaceans. They have strong legs and big feet for carrying their food. They use their sharp claws to capture their prey. 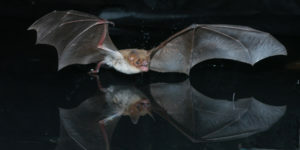 Fish-eating bats have brown fur that is dark gray at the base. They mostly roost in caves and crevices, but will also stay in rock slides. If you would like to read about them, you can find information here. Another adorable bat that lives in Mexico is called the Northern Ghost Bat. They are relatively rare. Their fur is completely white, with cute pinkish wings. It has big eyes with an almost hairless face. The Northern Ghost Bat prefers to roost in humid habitats like tropical rainforests. If you would like to read about these bats, you can find information here. And now, for a non-bat related story…Hurricane Irma left a lot of wildlife stranded. I would like to thank everyone who helped save various animals. There are 2 stories of people helping animals that I thought you would all enjoy. Here, people save a baby dolphin found about half a mile from the beach. Later in the story, they save an adult dolphin. You can watch the video here. In another story, some men found two manatees who had been stranded when Hurricane Irma sucked the water out of Sarasota Bay. They managed to carry both animals back to the water. Thank you ViralHog for giving me permission to share your video. Previous StoryHurricane, hurricane, go away!!! Next StoryIllinois, a state of mine!